Submitted by skwyd on Mon, 02/15/2010 - 09:47. 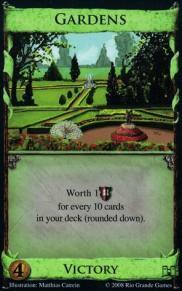 I really like the Gardens card and I've won a few games successfully with it. I'm hoping to improve the strategy for it. 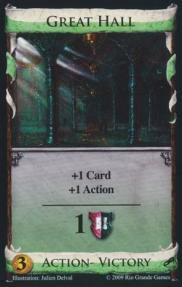 In previous games I've used the Ironworks to gain both Gardens and Great Halls. 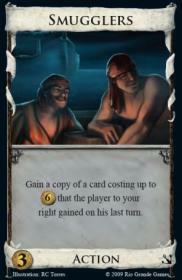 This pads my hand up for the Buy phase (due to drawing victory cards) and also bumps up the deck size and the victory points. 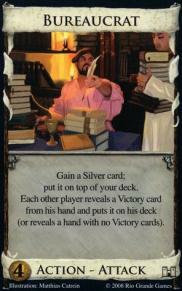 The Bureaucrat has been helpful to get Silver into the deck and also bump up the deck size. I'm not sure about the Throne Room. 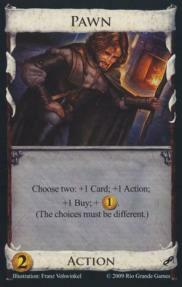 My thoughts were that if I used it on the Ironworks I could really gain a great deal of cards. Also, the Island is a new addition for me. My thoughts on that are to use it to thin down the deck slightly since there ultimately will be a lot of "dead" cards (Gardens, specifically). 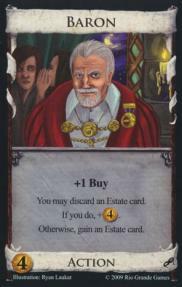 Lastly, the Baron seemed to be a potential winner as it is either increasing deck size (gaining Estates) or bumping purchase power (generating coins to buy) which seems to be a good thing. Plus, with the extra buy, you can always pick up another Copper to pad the deck size even more. 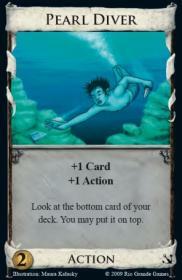 My only concern is that with fewer potential draw cards (only the Pearl Diver and Great Hall and Pawn), it may not cycle through quickly enough. I've played a similar deck before and took the game by a HUGE margin because my deck had over 50 cards. I'd like to make it even better. Any thoughts? Submitted by aalkema on Mon, 03/08/2010 - 16:09. We tried this one, and it was one of the fastest games we've ever played. It ended in under 10 turns. 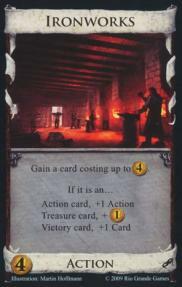 Within a few rounds the ironworks were gone, and the only way to get points fast enough was to ironworks for victory cards. Submitted by philippe.s.rey on Fri, 03/12/2010 - 00:12. Just add scout for instance instead of pearl diver, which I don't find very useful, the combo with baron, great hall and island is great, but not very new. Smugglers seems to be great too, because the province stack will not be the game end condition. 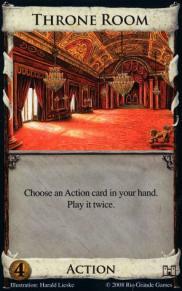 I would also definitely buy 2 Throne rooms since it combines well with baron, smugglers, great hall, bureaucrat, ironworks and pawn, allowing 3 buys / round sometimes. 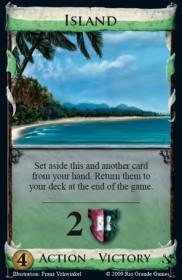 Combo is poor with pearl diver, scout, gardens and island. Another suggestion, to accelerate your deck cycling, you could add navigator... allowing thrashing your next hand if it's too "green" :). Submitted by Youcun on Tue, 07/01/2014 - 05:01. Submitted by Youcun on Tue, 07/01/2014 - 05:00. Submitted by Youcun on Tue, 07/01/2014 - 04:59. Submitted by Youcun on Tue, 07/01/2014 - 04:58. Submitted by Youcun on Tue, 07/01/2014 - 04:57. Submitted by Youcun on Tue, 07/01/2014 - 04:55. Submitted by Youcun on Tue, 07/01/2014 - 04:56.